Brentwood began as a clearing made in the woods by burning trees (hence 'burnt wood' which became Brentwood) to provide a stop-off point about one day's journing from the Thames for pilgrims en route from East Anglia to the shrine of Thomas Becket at Canterbury. 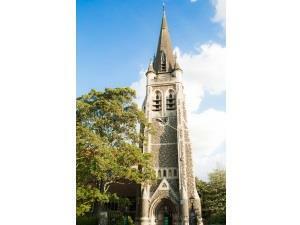 The first church building dedicated to St Thomas in Brentwood was a chapel built around 1221 to serve these pilgrims. The ruins of this original Chapel of St Thomas a Becket, with its walls of irregular ragstone and flint are still to be seen in the High Street. This is a Scheduled Ancient Monument.